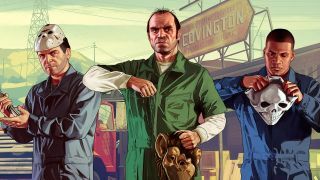 If you're one of the few yet to experience Grand Theft Auto 5 or you want to dip into the still thriving, deadly world of GTA Online... well, the game is going for as cheap as we've ever seen it. You can now get it on PS4 for $15 or Xbox One for, er, $15. The offer runs at both Walmart and Amazon, and you're saving $45 off the list price of Rockstar's classic. No, we wouldn't expect anyone to actually pay $60 for GTA 5 in 2019, but that's still a great price, offering an enormous amount of bang for buck with a game that can easily give you 100+ hours of quality, action entertainment. And that's before you even venture online, which is a whole other thing. Would we recommend the game? Well, it got 5/5 in our review, and has only gotten better with age, so $15 is a snip. There's so much to do in this game, so jump in on your chosen format and have a go. If you are keen to delve into the murky world of GTA Online, we've got a handful of helpful features to assist you in getting over that 'newbie' hump, where you seem to just die every five seconds. Here's our guide to making money fast in GTA Online, and our general overview of how to play GTA Online. Enjoy.